A map of the Troad (Troas). Troas among the classical regions of Anatolia. The Troada or Troad (Anglicized; /ˈtroʊˌæd/ or /ˈtroʊəd/; Greek: Τρωάδα, Troáda), or Troas (/ˈtroʊəs/; Ancient Greek: Τρωάς, Troás), is the historical name of the Biga Peninsula (modern Turkish: Biga Yarımadası) in the northwestern part of Anatolia, Turkey. This region now is part of the Çanakkale province of Turkey. 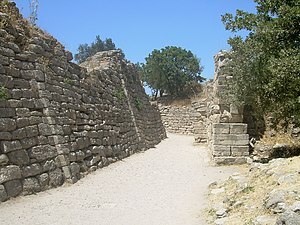 Bounded by the Dardanelles to the northwest, by the Aegean Sea to the west and separated from the rest of Anatolia by the massif that forms Mount Ida, the Troad is drained by two main rivers, the Scamander (Karamenderes) and the Simois, which join at the area containing the ruins of Troy. Mount Ida, called by Homer "many-fountain" (πολυπίδαξ), sourced several rivers, including Rhesos, Heptaporos, Karesos, Rhodios, Grenikos (Granikos), Aesepos, Skamandros and Simoeis [Iliad 12.18 ff]; these rivers, were deified as a source of life by the Greeks, who depicted them on their coins as river-gods reclining by a stream and holding a reed. The Troad gets its name from the Hittites' name for the region, Taruiša. This identification was first put forth by Emil Forrer, but largely disputed by most Hittite experts until 1983 when Houwink ten Cate showed that two fragments were from the same original cuneiform tablet and in his discussion of the restored letter showed that Taruiša and Wiluša (Troy) were correctly placed in northwestern Anatolia. According to Trevor Bryce, Hittite texts indicate a number of Ahhiyawan raids on Wilusa during the 13th century BC, which may have resulted in the overthrow of king Walmu. 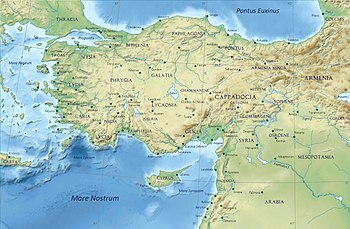 Bryce also said that archeological surveys conducted by John Bintliff in the 1970s showed that a powerful kingdom that held sway over northwestern Anatolia was based at Wilusa (Troy). Greek settlements flourished in Troas during the Archaic and Classical ages, as evidenced by the number of Greek poleis that coined money in their own names. The region was part of the satrapy (province) of Hellespontine Phrygia of the Achaemenid Empire until its conquest by Alexander the Great. After this it fell to the Diadoch Seleucid Empire, and then passed to Rome's ally, the kingdom of Pergamon. The Attalid kings of Pergamon (now Bergama) later ceded Mysia, including the territory of the Troad, to the Roman Republic, on the death of King Attalus III in 133 B.C. Under the Roman Empire, the territory of the Troad became part of the province of Asia, and later of the smaller Mysian province Hellespontus; it was important enough to have suffragan bishoprics, including Pionia (now Avcılar). Under the later Byzantine Empire, it was included in the thema of the Aegean Islands. Following its conquest by the Ottoman Empire, the Troad formed part of the sanjak of Biga. The apostles Paul and Silas first visited Troas during their journey from Galatia to Macedonia. Paul also referred to Troas when he asked his fellow worker Timothy out of Ephesus, to bring the cloak he had left there, a journey of about 500 kilometres (310 mi). The changes from the story, being recounted as "they" to "we" in Acts 16 and Acts 20, imply that Paul was joined by Luke when he went through Troas. ^ R. S. P. Beekes, Etymological Dictionary of Greek, Brill, 2009, p. 1511. ^ Bryce, Trevor (November 1989). "AHHIYAWANS AND MYCENAEANS – AN ANATOLIAN VIEWPOINT". Oxford Journal of Archaeology. 8 (3): 297–310. doi:10.1111/j.1468-0092.1989.tb00207.x. Archived from the original on 2013-01-05. Retrieved 12 July 2010.